SCEA announced today a new PSP bundle due out in June 2008. 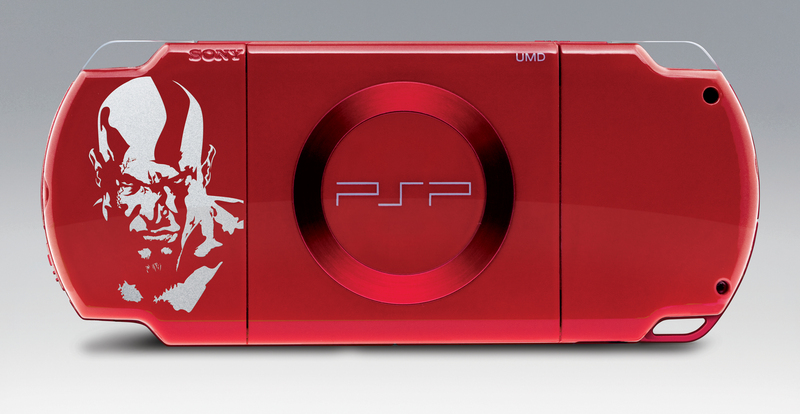 The $199 God of War PSP Entertainment Pack features a new "Deep Red" PSP, with a silkscreened image of Kratos himself on the backside. Sony's God of War: Chains of Olympus, a UMD copy of Superbad, and a Playstation Network voucher to download Syphon Filter: Combat Ops from the Playsation Store round out the bundle. "God of War is one of the biggest PlayStation franchises, and with its portable premiere on PSP just around the corner, we wanted to offer something special that would appeal to both loyal God of War fans and non-owners who want to enjoy PSP's multi-functionality," Scott A. Steinberg, vice president, product marketing, SCEA said in a statement. "This bundle delivers great value, starting with the 'Deep Red' PSP -- one of the most highly sought-after colors based on our consumer research -- and the Kratos silkscreen. We're also showcasing the diverse entertainment experience PSP offers, centered on a UMD game in God of War: Chains of Olympus that's every bit as impressive as its console sequels, a free download of the award-winning Syphon Filter: Combat Ops, and a box office hit movie in Superbad." Sony also announced a $499 80GB PS3 bundle built around MEtal Gear Solid 4, as well as an April release date for the Dualshock 3 wireless controller, but that isn't nearly as exciting as a new PSP color, is it? IS IT?!? The stand-alone release of God of War: Chains of Olympus is slated to hit store shelves next week, on March 4. Thumbnailed below are front and back shots of the new hardware, in all their high-res glory. View the images for their original resolution.